Reducing poverty is seen as the world's greatest challenge and in South Africa it is counted as one of the country’s triple threats, the other two being unemployment and inequality. 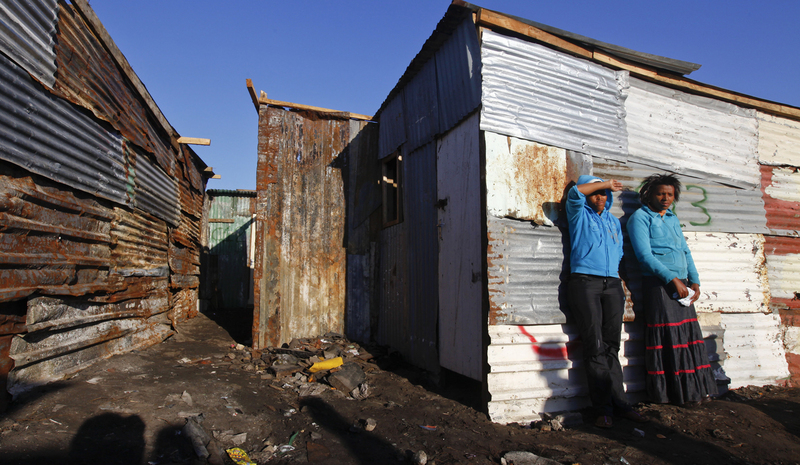 Statistics South Africa has published a report that updates the national and provincial poverty lines, setting the minimum socially acceptable standard to separate the poor from the non-poor. By GREG NICOLSON. Last year, the World Bank gave South Africa a good story tell. It released a report that said due to South Africa’s “slightly progressive” tax system and “highly progressive” government spending, around 3.6 million people have been lifted out of poverty, halving the number of South Africans living on less than $1.25 a day. Because of grants, free basic services and taxes favouring the poor, the poverty rate dropped from 46.2% to 39%. Tuesday’s Statistics South Africa (Stats SA) report uses different figures to count those living in poverty. Using the Income Expenditure Survey from 2010/11, which updated and reweighed a basket of goods and services after collecting data from 25,000 households, Stats SA’s new poverty lines come from a cost-of-basic-needs approach, including both food and non-food. It calculates the minimum amount of money you need to survive. Those who fall below that line live in poverty. It uses three lines of poverty – the food poverty line (FPL), the lower bound poverty line (LBPL) and the upper bound poverty line (UBPL). The FPL sets the rand value below which you can’t purchase enough food to meet a minimum energy intake, about 2,100 kilo-calories a day. The next two categories take into account other needs. Those below the LBPL line don’t have enough money to purchase both adequate food items and non-food items, so they have to sacrifice food to pay for things like transport and airtime. The UBPL group are still considered in poverty, but can generally purchase both food and non-food items. But looking at the 2011 poverty statistics, which the data is based on, the new measures for poverty show some increases in the number of people struggling. Rebasing the poverty line, from a FPL of R321 per-person-per-month to R335, means an increase from 20.2% of people living in extreme poverty increases to 21.7%. Not much of a difference. “The rebasing, however, brings about a substantial increase in the estimates for overall poverty (from 45.5% to 53.8%) when a switch is made from the existing upper-bound poverty line of R620 per-person-per-month to the revised level of R779 per-person-per-month. The same trend holds when one considers the impact of the rebasing of the national poverty lines on the depth of poverty (how far the deprived are from the poverty line) in the country. The change in the poverty gap among the extremely poor is negligible (6.6% to 6.9%) while the change for overall poverty is substantial (19.6% to 25.8%),” reads the report. Too much to decipher? Essentially, the latest statistics say that 21.7% of South Africans live in extreme poverty, not being able to pay for basic nutritional requirements; 37% of people don’t have enough money to purchase both adequate food items and non-food items so they have to sacrifice food to pay for things like transport and airtime; 53.8% of people can afford enough food and non-food items but fall under the widest definition of poverty in SA, surviving on under R779 per month. So despite the World Bank’s recognition of South Africa’s efforts to reduce poverty, many people are still struggling. Stats SA made sure to point out this is a shift in methodology, meaning that although more people are now categorised as falling below the poverty line, it doesn’t mean poverty is getting worse. It also pointed out that to measure poverty, the lines must be used alongside other information. However, these figures make it hard to see how poverty is decreasing, although reports often cite figures showing South Africans are in general improving in living standards measures (LSM). According to the data, KwaZulu-Natal had the highest poverty line in 2011 (R354 per capita per month) followed by Western Cape. Northern Cape and Eastern Cape have lower poverty lines, influenced not only by prices of food but consumption patterns and household size.